Princess Diana: Princess Diana Crash: The Strange Movements Of Paparazzi Andanson On The Night Of The Crash! Princess Diana Crash: The Strange Movements Of Paparazzi Andanson On The Night Of The Crash! Mohammed Fayed, Dodi's father has long insisted that there were a number of Secret Service agents from varying spy agencies around the globe, namely M16 and the French Secret Service DGSE that had infiltrated the ranks of the Paparazzi stalking Princess Diana and Dodi. This actually does not come as too much of a surprise considering that the Crown naturally wanted to be kept abreast of the going-ons of the wayward princess before she sprung the next "embarrassment." One such paparazzo was Jean-Paul Andanson, the late owner of the Fiat Uno seen speeding away from the crash! 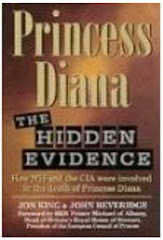 Uno Owner's Suspicious Movements On The Night Princess Diana Died! When one thinks about it infiltrating the paparazzi with agents was a brilliant yet obvious concept. As a paparazzi, an agent would have a legitimate reason to be hot on the tail of Princess Diana and her entourage. Also posing as a member of the paparazzi afforded any infiltrator the a good cover of anonymity. But most importantly posing as a member of the paparazzi enabled easy access to the princess! As previously mentioned on May 5th of 2000 Jean-Paul Andanson was found burned to a crisp in the charred wreckage of his one-time white Fiat Uno. Consequent forensic tests conducted on the Fiat Uno proved beyond a shadow of doubt that his car was indeed the one that collided with the Mercedes Benz in the tunnel! But of course in 1997 none of this had come to light...or had it and was it just conveniently ignored! What is now known is that Andanson was up and down the Mediterranean close on the heels of the vacationing Dodi Fayed and Princess Diana. Certainly on the day that Dodi and Diana flew back to Paris (August 30th) Andanson was there. But for no apparent reason or at any rate reasons best known to himself before dawn on August 31, 1997, a scant 6 hours after the Diana crash Andanson left Paris via a flight from Orly Airport bound for Corsica! So what exactly was he doing? Was it coincidence or was Andanson creating his alibi...certainly looks that way to me! So what was his alibi other than his weak claim that he was not in Paris at the time of the crash? Andanson's only proof that he was not in Paris the night of the crash was a receipt for gasoline purchase elsewhere in France (yeah right...anybody could come up with that!) Weak as his alibi was, compounded with the fact that he owned a white Fiat Uno, one would think that the French police would have taken more of an interest in Mr. Andanson and his whereabouts on the night of the crash. But no they were more than satisfied with his flimsy gasoline receipt alibi and furthermore quickly concluded that his White Fiat Uno was not the one involved in the crash! Andanson's family initially backed up his claims of being elsewhere on the night of the crash, his wife Elizabeth going as far as to claim that she had been with her husband all night at their country home, Le Manoir de la Bergerie in Cher. She did concede that Jean-Paul abruptly departed for Orly Airport aound 3.45 a.m. In later years on further questioning Elizabeth Andanson admitted she could have been mistaken about her Husband's whereabouts on that night, that apparently his job as a paparazzi had him always on the go! As for Andanson's kids, a son James and daughter Kimberley, they told the police they were under the impression their father was grape-harvesting in the Bordeaux region! very very good blog congratulations ! !